We are very blessed to live within a short driving distance to Disney World. We are able to go on short, quick trips to the parks multiple times a year which allows us to take on Disney in a more affordable way. I know most people don’t live near Orlando and therefore have to take longer, larger trips in order to have a Disney vacation. If you are just going to have ONE day at Disney World then Magic Kingdom is the park for you. And if you are having multiple park days? Then I still recommend having one “go big or go home” Magic Kingdom day. 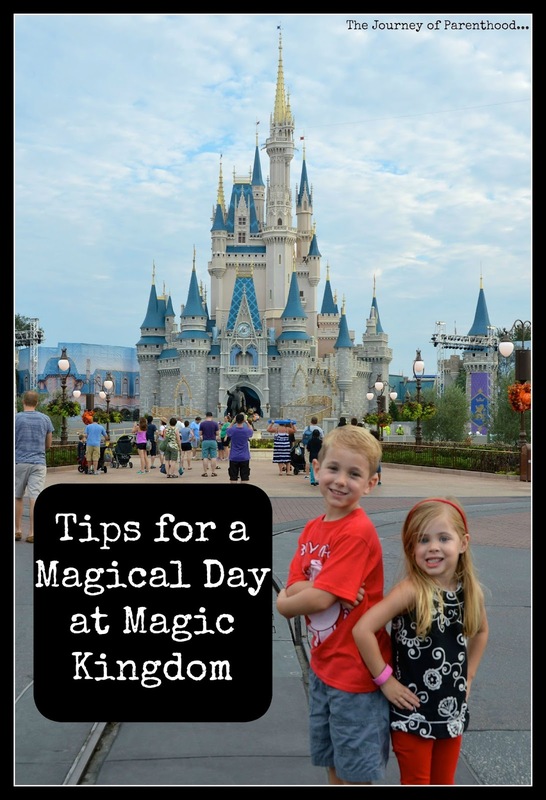 These are my tips that are specific to Magic Kingdom and making the most of ONE day at the home of Cinderella’s Castle! Planning is SO important when it comes to a Disney Vacation. Magic Kingdom is THE most popular park so it’s crucial to plan accordingly. I personally LOVE Touring Plans. It’s an excellent site that maps out the expected crowd levels for each day at the park. We always plan our trip for a day with an expected crowd level of 6 or lower. This is THE #1 tip I have: GO WHEN CROWDS ARE LOW! If you have to go on a higher level crowd day then I’d plan on at least 2 days at Magic Kingdom and I’d utilize the fast pass + system as well as the Touring Plans guides. We don’t stay on Disney property but if you do then you can book your fast pass + reservations 60 days in advance (at 7 am ET) and if you’re like us and don’t stay at Disney then you can book them 30 days in advance (also at 7 am ET). Unless you are staying on property then you do NOT want to visit Magic Kingdom on a day with extra magic hours. If you are on property then you may want to take advantage of these extra hours at the park. I’ve heard the very late ones (like when the park closes at 2 am) are the best for minimal lines. Obviously we have young kids so we wouldn’t attempt this! If you only have ONE day to spend at the park then it’s important to know your priorities. Rides? Character meets? Shows? Parades? Knowing what is most important to your family will allow you to properly plan a smoothly flowing day! If you have a princess lover then Cinderella’s Royal Table is a must-do at least once. Book 180 days out and get the earliest breakfast reservation possible. This allows you into the park before park opening so you can get great photos of the castle and enjoy an amazing breakfast before starting your day! Another great way to get in the park early is to book a Be Our Guest breakfast reservation. It’s a quicker dining experience and a much cheaper one as well. You can also pre-order your food in advance which makes it an even faster experience. You do NOT have to order one meal per person. On our recent visit we ordered just one meal and shared it. You can request a plate of free pastries that include more than enough to share among a typically family of four. I personally haven’t experienced other in-park dining but there are TONS of choices available at Magic Kingdom! We’ve done several of the quick service options and have always had a great experience. We personally don’t stay on property so we have never used a dining plan. I’m very frugal and have read a lot about both staying on property and the dining plan and neither are the most economical option so we pay out of pocket for all our dining experiences. Even if you are staying on property, be sure to run the numbers to see if the dining plan makes sense for you! Usually when you are there that early you do not have to pay for parking but will often have to use the resort monorail as the park one typically isn’t running yet. Once inside the park do NOT rush! Photopass people are available to get all your castle photos out of the way with few people in the shots and before you get crazy sweaty 😉 This is a magical moment to walk down Main Street and truly soak it all in before the crowds set in! Even if you don’t have a reservation to be in the park early, still plan to arrive at the gates 30-60 min prior to park opening. This way you can go through bag check and be ready for the opening show. Wait times are THE lowest during the beginning of the day so take advantage and ride as much as possible during this time! Everyone has different priorities when it comes to rides and experiences at Magic Kingdom. However the most difficult fast pass to get is 7 Dwarfs Mine Train. Right now that’s the “hottest ticket” item and is well worth waking up at 7 am book as soon as you can for your trip. My other personal recommendations for fast passes are: Peter Pan, Enchanted Tales with Belle, and Jungle Cruise. Meeting Mickey as well as Splash Mountain are others I’d recommend getting if they are important to you. You can book 3 fast passes per person in your party per day at the park. Once all three are used you are able to book more. So if possible to book all three early that frees you up to book more throughout the day! You are also able to change times as well as the choices of the fast passes so if you realize you aren’t going to need to use one change them to a different experience or if you need to bump a certain fast pass later then check to see if later times are available. You can also book different fast pass reservations for different people, even at the same time. My son loves Mine Train but my daughter doesn’t so on our recent trip I got fast passes for my husband and son for Mine Train and then at the same time had them for my daughter and myself to meet Ariel. It worked out so perfectly! Everyone will have to scan their bands (or cards if you don’t have a band) twice on each ride where you are using a fast pass. I saw a mom at the park recently who was wearing ALL the bands for her entire family. Pretty good idea to speed things up at the fast pass stops! Having a full day at the parks is a LOT of fun, however it can be tough on little ones. If you know your child needs a nap and is happier with a nap then plan to leave the park to go back to the hotel for a nice nap. I’ve done the park while pregnant and have been thankful for nap time as well! Plan on being gone for a total of 5 hours. 1 hour to leave the park and get to your room, 3 hours for nap, and another hour to get back to the park. While it can feel like you’re “wasting the day” by taking time for the nap, it can make a world of difference in how much fun you have in the evening time hours! A happy kid makes for a happy experience! Also putting the children to bed SUPER early the night prior is a big help! Our kids typically go to bed around 7:30 at home but the night before our day at Magic Kingdom we will get them in the bed at 6:00. That way they have a chance to fall asleep earlier and get that extra sleep to help them the next day. Use a stroller! My oldest is 6 and he still took full advantage of having the stroller at the park. It’s a LOT of walking. Not only is it a great way for the kids to rest (and fall asleep once the day ends and you are heading back to the car) but it’s a great way to be able to store all your gear for the day. Split up as needed! My husband and son love the mountains (Space, Splash, and Thunder) while my daughter and I don’t. When I make my touring plans I make sure I plan in something for my daughter and I to do in the same area as the ride my son and husband are riding (Tomorrowland Speedway near Space Mountain, Playground near Splash Mountain, and Tiki Room near Thunder Mountain). That way we are all having fun but staying close together so we can maximize our time in the parks! Know your child and prepare them accordingly. One of my children does best with a lot of prep in advance. He likes to know what’s going to happen before it happens (like the dip in Pirates of the Caribbean) whereas my other child does better when she’s not prepared. If we tell her a ride is dark she will be scared the entire time in line and be basically freaking out the entire time on the ride. She does better knowing nothing and just riding the ride! Yes, it’s a LONG day and there is a LOT to fit in. But remember that it’s okay if you don’t do it all. On our last visit our kids said they really, really wanted to just play in the playground in the Dumbo line. We spent a full hour there because they loved it and it ended up being one of their best memories of the day! Typically I have 3-4 book bags for our one day at the park. One will have all of our rain gear, another will have the extra outfits and jackets if needed along with snacks and small toys, in the hot months I usually have an additional book bag with “keep cool” items and then I have one book bag just for our expensive items. My camera, wallet, etc and it’s the only book bag we bring onto rides with us.
) as well as a couple extra cheap ponchos for the stroller. I also bring towels to dry off along with the extra clothing I mentioned earlier. Umbrellas are allowed in the park so I bring a small fold up one just in case for a shorter rain shower. s. I am obsessed with these towels and they work SO WELL. We were just at the park in 95 degree weather and they really helped us stay cool! Prior to our trip I use Touring Plans and create our own customized plan for the day. Because we go on low crowd days we have NO PROBLEMS getting in EVERYTHING we want to do. On this past visit we did everything we wanted and were done at 7. We had 2 free hours to hang out before the Electrical Parade! I created my customized plan and had them evaluate it. The plan allows you to put in your fast pass reservations as well as dining reservations and even add in break times throughout your day. They will either “optimize” your plan (which means they will arrange the order of the things you do to make best use of your time) or “evaluate” your plan (which means they will keep everything in the order you decide and then just tell you what your times will look like for the day. I personally enjoy the itinerary making process so I keep tweaking my personalized plan and let them “evaluate” it and then print it off to take with us. The site also has an awesome app that will let you view your itinerary and mark things off as you complete them. We had ONE day in the park recently and our day ran super smoothly thanks to our plan. We don’t buy a lot of souvenirs at the park but like to purchase one Christmas ornament each time we visit to remember our trip by. There is a great Christmas shop in the park and there is also one at Downtown Disney (now called Disney Springs) if your trip allows time for some shopping there it’s a great spot to pick up the ornament! When it comes to evenings in the parks we don’t stress about finding a spot for the parade and fireworks. We find one within 30 min of the start of the parade or show and have never had an issue getting a spot with a view. This past visit my husband found a spot on Main Street and I took the kids to some shops and to look around while he sat with our belongings to hold our spot. A full day at Magic Kingdom is so fun! With the cost of tickets to Disney only getting higher and higher each year, spending an entire day at a park is really the best bang for your buck. By planning it out well in advance and utilizing the available tools to create the best plan for your family, you can easily see and do everything you want and truly experience the magic that Disney has to offer at Magic Kingdom! Looking for tips on how to save money for a Disney Trip? Here are my personal tips on how we afford Disney! Previous Post Tess is 12 Months Old!